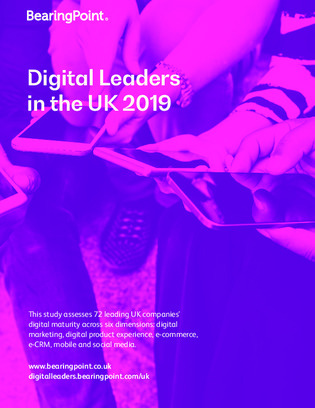 This report from management and technology consulting firm BearingPoint is intended to give an assessment and provide a constructive analysis of UK companies’ digital maturity, hence the nature of the statistics provided. In general, most companies score relatively low with regard to fulfilling the criteria, and few companies receive a high score across all dimensions. This is natural given the digital lifecycle and maturity of UK firms, as well as the difficulty in spreading time and resources to encompass all aspects of improvement. UK companies achieve higher scores within the top 10 range than their international counterparts, exceeding the average scores of all European countries except Germany. This shows UK firms’ competence in investing in their digital presence. However, the UK’s overall calibre is let down by companies below the top 10 ranking, and this study shows a disproportionate drop in the dimension results due to the scores of certain industries and their approach to digitisation, which is noteworthy.